This is Part 3 of a series on Kinesiology Tape. Read Part 1 Here & Part 2 Here. The Kinesio Taping method was developed by the creators of Kinesio Tex taping products. It is based on the theory that the tape affects somatosensory receptors to alleviate pain while creating “lift” to the skin that promotes lymphatic drainage. This method proposes that the direction the tape is applied will either inhibit or facilitate the muscle groups over which it is applied. For example, when you apply the tape from the insertion of the biceps towards the elbow and forearm towards the origin of the biceps near the shoulder, then the tape will inhibit the biceps muscle from contraction. If applied the opposite direction —from the origin to the insertion— then the tape will facilitate the biceps muscle in contraction. The Kinesio Method also accounts for the tension placed on the tape. According to this method, a light stretch or tension (15% stretch) should be placed on the tape during application when the goal is to inhibit a certain muscle contraction. Likewise, a moderate stretch or tension (up to 50% stretch) is used to facilitate a certain muscle. The Kinesio Method also posits that the muscle being tape should be elongated or stretched to varying lengths to either facilitate or inhibit muscle contraction. To facilitate a muscle using the Kinesio Method, the muscle/joint involved should be placed in end range stretch prior to applying the tape. To inhibit a muscle using the Kinesio Method, the joint and tissues should be placed in a slight stretch (mid-range or less) prior to applying the stretch. The Rock Tape method of taping differs from the Kinesio method in a few distinct ways. This method is based on the theory that, once the tape is applied, the brain and proprioceptive system will up-regulate or down-regulate the muscles over which the tape is applied. The idea is that your brain will make the necessary neuromuscular adjustments once the tape is applied. For more reading on the theories of how this works, read part 1 of this series here. 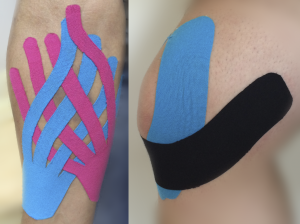 Unlike the Kinesio Method, the Rock Tape Method does not emphasize the direction that the tape is applied. In fact, according to this method, the only truly important step is to ensure that the tape is being applied with some tension (10-25%). Since this theory relies on the brain and proprioceptive system regulating itself from the input from the tape, there’s no reason to worry about applying the tape from origin to insertion to facilitate a muscle. You would simply apply the tape over the muscle you wish to affect and let the brain and nervous system handle the rest. The only thing that is required is that the tape is applied with tension, so it can provide that proprioceptive or neuromuscular input needed to affect the neuromuscular system. Even then, there is no need to worry about differing tensions and whether they facilitate or inhibit. Simply apply the tape with 10-25% tension —Rock Tape comes from the factory with 20% on the paper. The limbs or joints can be placed at end range stretch to provide some additional proprioceptive input, but this is not necessary using the Rock Tape Method. Most of the literature supports this application strategy in that, most studies show that differing tensions of tape application does not change the affect the tape has on the joint or muscle group  . Before we discuss principles of application, we must first understand the different shapes, sizes, and cuts that are commonly used when applying kinesiology tape. The first, and simplest, cut is the “I” strip. It is just a length of kinesiology tape. Lengths may vary, but all “I” strips are the no-frills, straight-out-of-the-box sections of tape. These sections provide simplicity in application and can realistically be used for almost any application or affect desired, except for when a fan strip is needed. Typically, “I” strips are applied over longer muscle, like those in the leg or back. The tension on “I” strip can be applied by placing one end as the anchor, then applying tension to the tape and it is laid over the skin. Another adaptation is what is referred to as a “bandaid” application. In this application, the “I” strip is stretched in the middle and applied directly over an area the therapist or trainer would like to pin-point and the ends of the strip are then applied without tension. The next simplest cut is the “Y” strip. These strips are made by taking an “I” strip and cutting a slit down the middle of the strip on one end, leaving at least 1-2 inches at the end as an anchor point. These strips are convenient when applying kinesiology tape across a joint space, like the knee or shoulder. The anchor point can be placed on one side (distal or proximal) of the joint, and either arm of the “Y” can be applied around joint. This is the most common application method for knees, heels, and shoulders. Moving up in complexity is the “X” strip. Like the Y strip, it is created from an “I” strip. The difference here is that the strip is cut down the middle from both ends, leaving a section in the middle of the strip uncut. These are helpful when attempting to cover greater area while still providing tension towards a central point, like between the shoulder blades. The Fan strip is the most complex of the differing cuts and requires the most time to get prepped. It is made by taking an “I” strip and cutting 2-3 lines down from one end of the tape, leaving about 2 inches at the other end. Fans are used mostly for edema and fluid dynamic applications and have been shown to improve fluid movement and lymphatic flow in acutely inflamed and post-operative areas of the body . Fans are typically applied with very little stretch, enough to simply produce some “list” to the skin and underlying structures. When deciding to use kinesiology taping with a patient or client, we need to understand what we wish to achieve with the tape. Are we looking to provide some immediate and acute pain relief in order to help our client tolerate exercises or treatment better? Are we trying to decrease inflammation or swelling to an area of the body that we wish to treat more later? Or are we aiming to facilitate appropriate motor patterns to help improve some postural dysfunction that nay be leading to pain? Each goal or intended outcome requires a different application strategy to achieve those desired affects. For pain mitigation, the goal would be to both stabilize the involved structures and then “off-load” or provide novel sensory input to the area in an effort to reduce or block the pain sensation. If you remember back to your neuroscience class from college, you know that pain receptors (nociceptors for the nerds of us out there) are unmyelinated and slower transmitting fibers. Mechanoreceptors, on the other hand, are myelinated and transmit information much more quickly to the brain. By applying the tape directly over the skin of the affect muscle(s), we are providing stimulus to the mechanoreceptors which can “block” the brain from receiving the information from the pain receptors. It’s basically using what we know about the Gait Theory of pain to provide some immediate relief to our clients and patients. Many applications for pain mitigation involve either a couple of “I” strips or a “Y” strip to provide some stabilization, and then an “I” strip applied as a bandaid directly over the site of pain. When decompression is the goal, we are trying to create that lift that can improve fluid dynamics and lymphatic flow. This is where the fan comes into play. Typically, we try to position the targeted area in some position that provide a slight stretch to the skin, and then apply the fan with very little tension over the area. Typically 2 fans are applied so that they criss cross one another to cover the affected are and provide that lift to improve circulation. The neurosensory effects of kinesiology tape are still being researched and we are learning new things about this type of effect all the time. When using kinesiology tape to provide some neurosensory input an area, we are relying on the mechanoreceptors and proprioceptors in the taped area to transmit information to the brain, and for the brain to respond —either by up-regulating or down-regulating the taped area. There are varying methods to achieve this goal depending on what area of the body you wish to influence. The basic technique is this: Position the patient or client in the desired postural. This could be with shoulder blades retracted, depress, and downwardly rotated. Then apply the kinesiology tape in the direction or vector you wish the muscle to pulls. So for this example, it would be at an angle from perhaps the middle of the clavicle down towards the opposite hip. This will provide neurosensory input to all of the muscle groups responsible for retracting, depressing, and downwardly rotating the scapula. Those are the basic fundamental principles of applying kinesiology tape. Perhaps in the future, we will do an in-depth review of each of the desired outcomes of kinesiology tape and dive into specific application techniques for different body structures and areas. In the meantime, read, learn, and continue to build your skills with kinesiology tape. It’s a great tool to have in your treatment toolbox. If you missed the first two parts of this series, check out Part 1 Here & Part 2 Here!